Rangers have the option to be more strict if they deem it necessary. I assume you will have to contact a ranger at the particular park.There's registration and signing a waiver and clean caving guidelines. This is a start at least. This is good news! Glad to see the state of TN finally starting to be a little flexible on this issue. I think it's time to start planning a trip to Rumbling Falls. we want to visit or before? I don't have any more info so I suggest you call whatever park with a cave you're interested in and find out who to talk to and take it from there. boreholio wrote: I don't have any more info so I suggest you call whatever park with a cave you're interested in and find out who to talk to and take it from there. I know the park ranger where I want to go. I can email him soon to see what he has to say. From what I hear, the State has been fairly reasonable in giving cavers Permits to work in other caves that are not on this list. Ken Oeser here in the Nashville Grotto, for example, has had an on-going permit to map caves in Cedar of Lebanon State Park. I had a permit to research historical names and dates on the walls in Dunbar Cave. Joe Douglas has had a permit to survey in Camps Gulf Cave. These caves are on the new list above, but they are just an example. So, if your favorite cave is not on the above list..............ask for a permit. I asked a park ranger. Request denied. It was a cave that is now on the list so I will ask again. Also, there was (is) no place to ask for a permit online or anything to tell a person where to go to get a permit. Hopefully that will change soon. BTW, Larry, did the state reasonably let you have a permit to go in Grassy Cove Saltpeter Cave to research your book? I did not request a permit for Grassy Cove Saltpeter Cave. The "Caves of Grassy Cove" book will be a history book, so, except for photos, there is not much need to re-visit the caves. But, I do still need photos, if anyone wants to volunteer. Not only of the Saltpeter Cave, but other caves in the area as well. And...............that was John Hoffelt in Camps Gulf Cave, not Joe Douglas. I know Joe Douglas has had permits for other caves. Hopefully they will come for an access point on-line to make this easier. Fishermen get Fishing Licenses, hunters get hunting licenses, and we should be able to get caving permits. A friend and I are currently in the process of obtaining a permit for one of the above listed newly opened caves. We called the rangers office a couple of times before being put in touch with the HRIC (Head Ranger In Charge). This poor guy has been given no procedure to follow for permitting visitation and seemed to not even know a lot about the states new policies. He knew that the caves were supposed to be open and that was about it. He was not even sure what exactly "guided tours" meant. They have no guides and he realized that the best people to guide the trips were cavers themselves. We were sent the release of liability forms via snail mail and were to sign them and send them back the same way. It really seemed like we were the first ones to request a permit for any of the caves located in this particular park going by the lack of knowledge the HRIC had. We should know about the status of our permit Monday or Tuesday. Hopefully there won't be any setbacks. And by the way Stephen Brewer, I'm up for a Rainbow Falls trip whenever!! KWW wrote: A friend and I are currently in the process of obtaining a permit for one of the above listed newly opened caves. We called the rangers office a couple of times before being put in touch with the HRIC (Head Ranger In Charge). This poor guy has been given no procedure to follow for permitting visitation and seemed to not even know a lot about the states new policies. He knew that the caves were supposed to be open and that was about it. He was not even sure what exactly "guided tours" meant. They have no guides and he realized that the best people to guide the trips were cavers themselves. We were sent the release of liability forms via snail mail and were to sign them and send them back the same way. It really seemed like we were the first ones to request a permit for any of the caves located in this particular park going by the lack of knowledge the HRIC had. We should know about the status of our permit Monday or Tuesday. Hopefully there won't be any setbacks. And by the way Stephen Brewer, I'm up for a Rainbow Falls trip whenever!! I just called Fall Creek Falls and spoke to Drew. He said all I need to do is fill out the clean caving guidelines form & liability form then I get a permit and I'm good to go! 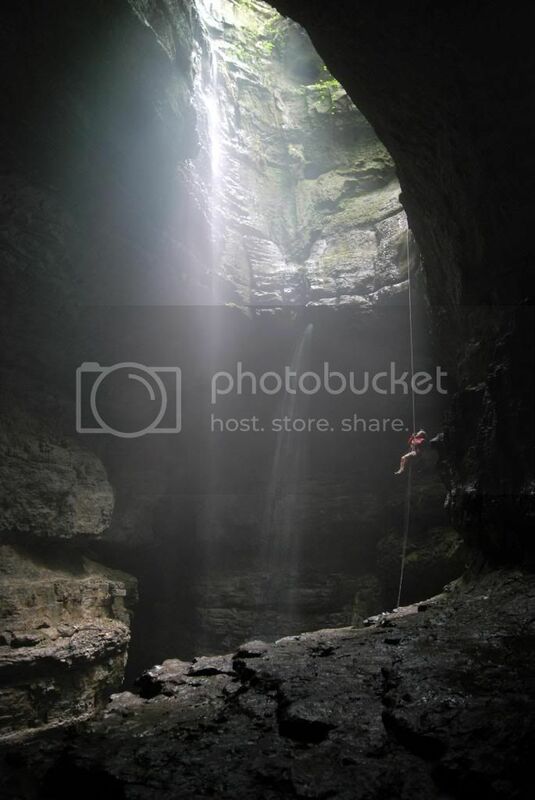 I am going to Fall Creek Falls fourth of July weekend and I want to explore Camps Gulf Cave...they said you have to have gear. Do you guys rent? Are you going? Can you email/call/text me someone who might be able to let me rent gear or meet up with them. Anything you can say will help. I need to get in this cave. Apparently a 300ft drop. So, ha I need gear, but I'm sure ya'll know that. About a week ago I emailed Dunbar Cave to set up a Nashville Grotto trip to Dunbar Cave. The response? They haven't heard ANYTHING about State caves being reopened and Dunbar Cave is NOT open.